This week’s stitch on TAST challenge by SharonB is beaded version of butterfly chain stitch. The basic butterfly chain stitch sampler is here, when it was worked as part of this challenge. The beaded version is explained by SharonB on her blog. 1.The first row is the basic beaded butterfly chain stitch. In the second row, single and double beads are alternated. With the set of straight stitches worked at two levels, the beaded chain goes up and down alternatively in the third row. 2. Beaded chain was worked on top instead of centre, and worked on bottom too in the next half of the first row. Straight stitches worked at two angles alternatively, beaded chain worked on that.in this way too, the beaded chain moves up and down on the second row. The centre of the straight stitches are beaded, the beaded chain stitches are worked in a way to keep the beads alternatively at top and bottom in the third row. 3.I wanted two threads to pass through the beads on the straight stitches, which I couldn’t accomplish, so the second straight stitch was twisted to hold the beads in place, the beaded chain is worked after that on the first row. Beaded butterfly chain stitches worked on beaded buttonhole stitches in the second row. 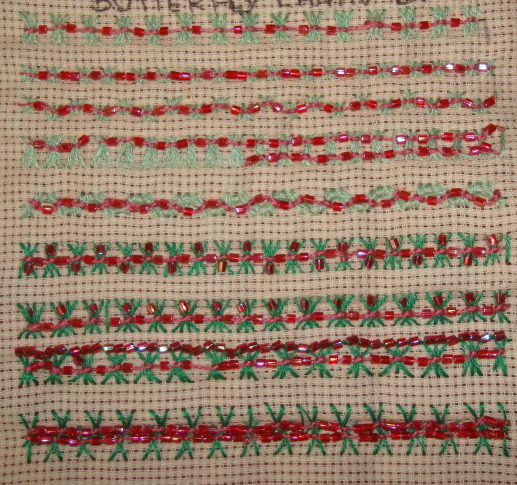 The straight stitches were worked up and down, two rows of beaded butterfly chains are worked on it in the last row.